This thread is for the King George V class battleships that served in World War I. The class included the lead ship HMS King George V, along with sisters Ajax, Centurion, Audacious. I'm trying to model a KGV (WW1) into a CENTURION /ANSON as she spent a good deal of time during WW2. I've only been able to located a few fuzzy pictures, but am trying to find better details as to thr "conversion", such as the bridge, a/c hanger and port side camo. CENTURION/ANSON actually had an interesting career, intended to be a "blockship" in Tripoli, but ended up with a longer career. Last edited by MartinJQuinn on Fri Feb 01, 2019 8:02 pm, edited 1 time in total. This is the CENTURION /ANSON, armed with "quaker" cannons and painted secondary's. She went to Gibraltar, rounded the horn to come back to Alexandria, where her original mission was cancelled. CENTURION/ ANSON actually escorted a convoy, but was called back when it was rumoured that the Italian fleet had sailed (pom-poms vs whatever the Italians could bring was not a healthy deal). Adm Sommerville decided that she was to much a "bomb magnet" in harbor (GEORGIC was bombed and beached for being too close in proximity), so she was sent to the Indian Ocean, and lost "A Turret" in a storm. She returned to Bombay, and spread rumours that she lost her turret in a fight with a raider. Anyway, in the end, she fulfilled her original mission, leading a column of ships to form a breaker off Normandy. The Germans thought they had sunk a major ship with heavy loss of life when only the seventy sailors aboard abandoned ship. I don't think she ever carried a real hangar. The fake hangar appears to be a rectangular box. There is a fairly poor quality image of the ship's port side at https://www.awm.gov.au/collection/C237948. 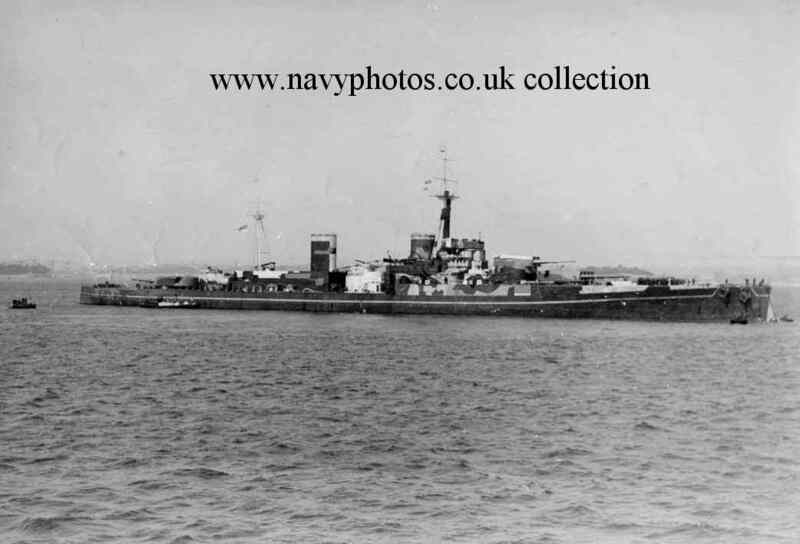 Another starboard side photo is at http://www.navyphotos.co.uk/Battleships ... ntrn1b.jpg. This has perked my interest, and I’ve been re-reading “The Phantom Fleet” by A.Cecil Hampshire, which tells the story of Centurion/Anson. I wanted to try a model in 1/350 scale, and bought the ISW Orion, which is a member of the previous class, but similar enough to suffice. Also bought a 1/400 Heller KGV. The turrets and funnels can be used on the Orion to make a pretty close approximation of the dummy Anson. Have collected pictures and descriptions of the ship, but can’t quite get my head around some of the details, especially as viewed from above. We’re all the disguise structures strictly for the side view, or did they include fake decks as well? I’ve seen some pictures of how the Germans handled this on disguised merchant cruisers, but didn’t know if this applied here.